On Amazon . . .
Print, E-Book, and "Look Inside" Preview . . . This is an amazing interview Mark. I ordered my book a while ago through Amazon UK but still no news. I can't wait. A brilliant and important endorsement. Good job Mark! I would love to hear a whole hour on just the relationship between Jan and Brian. Book page . . .
A nice new blurb from writer Gary Pig Gold . . . Thanks Gary! It was fifty (!) years ago that I first encountered "Popsicle" out on my schoolyard playground, and it can still remind me this full half-century later of what a unique and, yes, playful talent William Jan Berry was. But the man wielded a pure and prodigious musical force of simply staggering means as well, and The Jan & Dean Record, as no book before (or need be in the future) examines it all in full and fascinating detail. Mark A. Moore, as always, has researched his subject with utmost thoroughness, presenting in the process an actual, factual rendering – at last! – of the very birth of California Rock. Jan and his ever-faithful sidekick Dean O. have long deserved such a close and respectful recounting; Mark's book does that . . . but so much more as well. 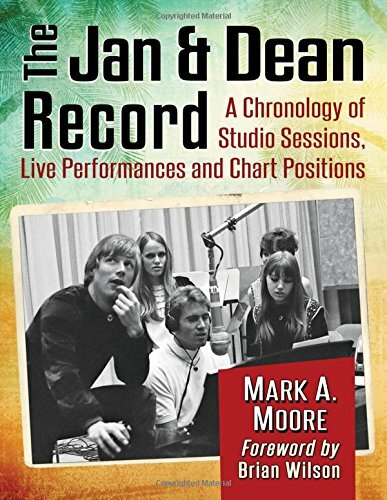 This is a long awaited and thoroughly engaging book author Mark Moore has put together on the music, careers, and personal lives of the enormously successful music duo - Jan & Dean. It is filled with details of all their business transactions, personal lives, and music sessions including the musicians and singers who were on those sessions, many of whom are featured in the film, The Wrecking Crew. Of particular interest to me is the chronology of Jan Berry’s personal and professional development from his high school days, where his interest in music began, all the way up to his passing in 2004. He was an amazingly talented, ambitious, and dynamic person. For me it is an especially poignant read learning about Jan’s early life and discovering professional details I didn’t know about during my 5 years with him as his partner and collaborator. It filled in many blanks in our personal history. This is a comprehensive and fascinating read for anyone interested in music of the '60’s in which Jan & Dean were enormously influential. I agree. Jill gave a fantastic review!! Her review also shows how important documentation is. There's no one that was closer to Jan than her and even she didn't remember all those details. Keep the reviews coming! NOTE: Some universities not listed here are offering electronic access to the book for students and faculty.